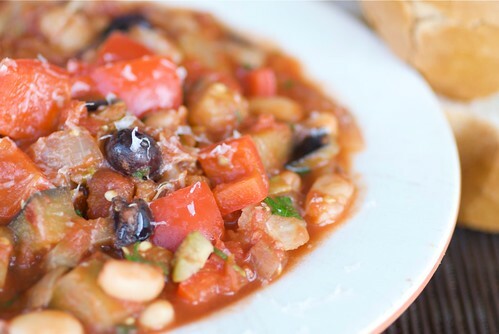 Food Blogga: Who Needs Meat When You've Got Hearty Mediterranean Vegetable Stew with Olives? Who Needs Meat When You've Got Hearty Mediterranean Vegetable Stew with Olives? In my last post I mentioned that when I was a child I felt sorry for kids whose moms made "meat and potatoes" dinners. That was until I heard of moms who were vegetarians. I thought that was tragic. I think I was about eleven when I discovered vegetarianism from a student teacher who was raising her children to be vegetarians. No hamburgers on the grill? No hot dogs at baseball games? No chicken parm sandwiches on Sunday night? What kind of a mother does that to her children? I wondered. If it weren't for my mom's meatball sandwiches, I don't think I would have made it through middle school. Then one day several years later, I did the unthinkable. I became a vegetarian; not because I wanted to ruin my children's lives (I don't have children), but because of an unfortunate incident with some tainted chicken. I didn't eat meat for years after that. I do eat meat now, but I still love vegetarian meals which I eat several times a week. And since I'm featuring one-pot meals this week, I want to share my recipe for Mediterranean Vegetable Stew with Olives. For those of you who wonder whether or not a vegetable stew can be as satisfying as beef stew, I'm telling you, Yes, it can. Since it's loaded with fiber-rich vegetables and high-protein cannelini beans, this vegetable stew is filling yet low-cal and healthy. It's reminiscent of eggplant caponata, but has more layers of flavor since it's got licorice-scented fennel and briny Kalamata and Cerignola olives. I don't have to tell you to sop up the juices with good, crusty Italian bread. I don't miss the meat in this vegetable stew at all. Of course, I don't plan on giving up my mom's meatball sandwiches. That would be tragic. Note: Omit the grated cheese, and this recipe is vegan. 1. In a large skillet over medium-high heat, heat oil. Add onions, and sauté until just transparent, about 3 minutes. Add garlic and fennel, and cook 2 minutes. Add eggplant and peppers, and cook 3-4 minutes, or until slightly softened. Add wine, and cook 5 minutes. Add tomatoes. Reduce heat to low, and simmer for 10 minutes, or until vegetables are tender but not mushy. Add olives, cannellini beans, lemon zest, fennel seeds, salt, and crushed red pepper. Stir well, and cook until heated through, 3-4 minutes. Stir in fresh herbs. 2. Serve with crusty Italian bread, or serve atop polenta, rice, or wide pasta noodles, such as parpadelle. Garnish individual servings with desired amount of grated cheese. My dad has always been a vegetarian so I grew up with diversity from my moms kitchen. I couldn't give up meat and fish altogether but it's wonderful to balance out our menu with wonderful dishes like this one Susan. I'm definitely a fan of rich vegetarian stews, and this sounds like a great one! The fennel and olives sound delicious in this. thanks for this post! I am vegetarian and it seems like most of the great recipes have meat in them!!! Nobody ;-P... I love such vegetarian dishes! I'm not vegetarian but I adore veggies :D, so your dish sounds perfect now that I want to start a diet... again. Olives give the stew such a different twist. Oh yes, this sounds amazing. I love olives, could eat them every day. Oh, oh, oh!!! I love these kinds of stews, and such a fan of BIG Olive flavor! No doubt that this would make me so happy, I know I wouldn't miss any meat. Those cannelini beans are some of my favorites. I do enjoy meatless meals every now and again too -- not out of guilt or whatever, but it makes me feel refreshed. Of course I could never do without the occasional steamed pork bun :) This stew would also do a good job of satisfying my hunger pangs! I always go meatless:) This stew looks amazing! Sounds so satisfying and I love the addition of olives! val-At least you learned balance, which is really so important for your health. megan-This one is meat-less and great. I promise! kalyn-Me too! Especially the ones from the local Italian deli. letmeeatcake-Getting enough veggies in your diet is easy with this stew. tanna-Aren't cannelini beans the best? mark-It does make you feel lighter, doesn't it? That sounds fantastic!! This could be a good superbowl meal for me and my husband!! I got a few hits from your blog: and now know why :) Thanks for including my lentil lemony stew! Dear lord, this looks like a perfect soup for the weather we're having. I hear you all had a tornado in SoCal yesterday! Up here's it raining sideways. This sounds delicious! You did make me laugh today. Thank you! I definitely veer towards vegetarianism, though my kids are horrified at the very idea! I still try to tempt them with veggies!! This is just the perfect stew for this cold spell Susan! Love this recipe. Think I will make it this weekend...The fennel and the olives sound so good! I never even met a vegetarian until we moved to Florida. I remember feeling the same way as you. My mother used to pack meatball subs and sausage and pepper sandwiches in my lunchbox, while all the other kids got peanut butter and jelly. She occasionally broke down and made veggie stews like this, and they were always enjoyed and appreciated. Your stew looks lovely and satisfying! My husband still wrinkles his nose at the idea of vegetarian anything. (He does love my vegetarian chili though...sometimes I can win him over!) I would LOVE this stew - I should make it just for me! (hubby won't be keen on the eggplant. Or olives. Boo.) Sounds so veggie-packed and delicious. I've developed LESS of a taste for meat as I've gotten older, but likely it's due to being much more aware of just how fulfilling a meat-less meal can be. Mike and I would go nearly meat-free if it wasn't for the Little Carnivore. We could survive on fish for protein and occasional chicken. Love this stew recipe! It's kind of weird that having a meal without meat makes people ask if you're vegetarian. I'm not, but I'd totally go for that stew! kelly-It would make a great Super Bowl dish! stephanie-It didn't affect where we are, but, whoa! that was scary. deeba-That's not too surprising. Kids and hamburgers are a tough couple to break apart. susan-OMG, sausage and pepper sandwiches. Mmmm.... Sounds like our mothers were very much alike. kate-Yeah, I know exactly what you mean. I like the balance. lynn-Yeah, it is kind of weird, isn't it? I'll be right over. Thanks! including Paul McCartney. Recommended reading for you and your respondents: The Face on Your Plate, by Jeffrey M. Masson. An education in a book.